Do not rinse the dropper. Replace the dropper and tightly close the bottle after each use. To avoid contamination, do not touch the dropper tip or let it touch any other surface. Discard any unused mixed solution. Do not save for future use. Using a mouthpiece or face mask with the nebulizer, inhale the prescribed dose of medication into your lungs as directed by your doctor, usually 3 or 4 times daily as needed. Each treatment usually takes about 5 to 15 minutes. Use this medication only through a nebulizer. Do not swallow or inject the solution. Do not mix with other medicines in your nebulizer. To prevent infections, clean the nebulizer and mouthpiece/face mask according to the manufacturer's directions. 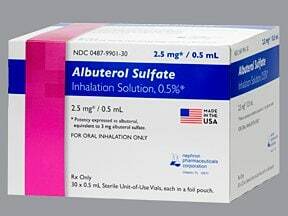 List Albuterol Sulfate 2.5 Mg/0.5 Ml Solution For Nebulization side effects by likelihood and severity. What should I know regarding pregnancy, nursing and administering Albuterol Sulfate 2.5 Mg/0.5 Ml Solution For Nebulization to children or the elderly? Does Albuterol Sulfate 2.5 Mg/0.5 Ml Solution For Nebulization interact with other medications? Different brands of this medication have differentstorage needs. Store at room temperature or in the refrigerator as directed before opening. Do not freeze. This medication may need to be refrigerated after opening. Check the product package for instructions on how to store your brand, or ask your pharmacist. 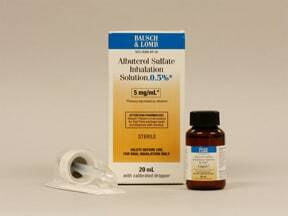 Are you taking Albuterol Sulfate 2.5 Mg/0.5 Ml Solution For Nebulization? 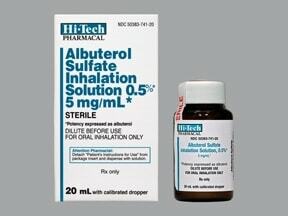 Are you considering switching to Albuterol Sulfate 2.5 Mg/0.5 Ml Solution For Nebulization? How long have you been taking Albuterol Sulfate 2.5 Mg/0.5 Ml Solution For Nebulization?